Also known as the Cygnus Loop, the Veil Nebula Complex is formed from the remains of a supernova which exploded in our galaxy about ten thousand years ago. Appearing in our sky as a three degree expanse of glowing gases, the Complex is actually around 80 light years in diameter. 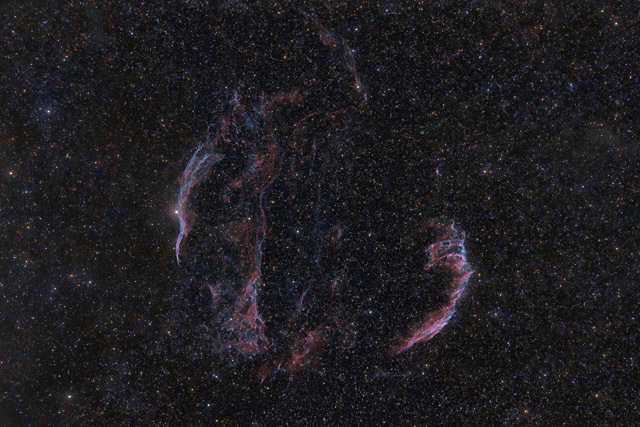 On the left (west) side of this image is NGC 6960, the "Witch's Broom" portion of the Veil Nebula. NGC 6960 appears to pass through the bright star 52 Cygni, although 52 Cygni is actually a foreground star. On the opposite side of the Loop is NGC 6992, the Eastern Veil Nebula. This portion of the nebula contains IC 1340, the bright portion at the top of NGC 6992. Towards the bottom left of the image is NGC 6979, Pickering's Triangle. In this image, North is Up. This image is cropped to 85% of the original frame. Software Used Images Plus 5.75 Beta for camera control, calibration, stacking, and digital development. Images Plus 5.75 Beta for feature mask, star masking, smoothing and noise reduction, and star shrinking. Photoshop CS5 used for levels and curves, hue/saturation colorizing, hue adjustments, lab color, vibrance, match color, selective color, high pass filter, and unsharp mask. Gradient Xterminator for gradient removal. Registar for registration and stack alignment. Carboni Tools for additional noise reduction and smoothing. Focus Magic for focus restoration. HLVG for additional color adjustment. Notes Originally I had planned to capture this as an RGB image. While I had way more data than I needed, I wasn't very happy with how the RGB image looked. At that point, I decided to capture some Ha and OIII data to see if I could create a better look. I'm very happy I did this, as it allowed me bring out the faint filaments much better, particularly in the OIII data. It also helped to enhance the fine details in the nebula significantly. I had used OIII data for the first time after Rich Richins offered his OIII data for my Heart and Soul Nebulae image. I was pleasantly surprised with how much it helped that image, so I decided to buy an OIII filter of my own. This is the first time I've made an image using OIII with all of my own data. The OIII is a lot of fun to capture, and it appears it can help a lot on some images. This image is also one of the first times I've used Images Plus' new Feature Mask tool. The Feature Mask allows me to separate the nebula from the stars, which makes it much easier to pull out details in the nebula. It is proving to be a very valuable addition to this already impressive program.